When it comes to Mold Removal, Puroclean works with many well-trained Environment Hygienists and Laboratories in an effort to protect the families involved in a potentially dangerous mold situation. If your property has sustained recent water damage, it is vital to have the water removed and the structure dried promptly. A Puroclean technician will be alert for any visible signs of mold. In the event mold is found, an on-site technician may recommend that you vacate the affected area while the mold cleanup and associated containment process is being safely completed. The safety of you and your family will always come first. STEP 1: Don't Panic. Do not disturb the mold until it is evaluated by a professional. A postage size area of mold can contain over 65 million mold spores. Disturbing the mold colony can release these spores into the air. STEP 2: Contact Puroclean Home Rescue. We will determine what caused the mold, establish a plan for removing the mold, and determine what is necessary to prevent the mold from recurring. Puroclean is uniquely qualified to remedy all mold losses. Puroclean professionals are trained by the IICRC in mold removal techniques and follow the S520 standards. Advice on how to clean up mold in your home safely (poster). Within minutes of water intrusion, damage can begin. Thus prompt action is important following a water-related disaster or accident. The speed with which you take action to begin the water damage restoration process will determine how much can be salvaged. Unwelcome moisture not only ruins carpeting and stains floors, ceilings and walls, but if left uncorrected can diminish the value of the property, which drastically affects financial status. One of the biggest problems caused due to water damage is molding. Molds are part of a group of micro-organisms called fungi that also include mushrooms and yeasts. 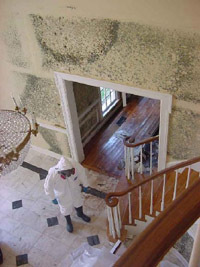 Mold formation is the greatest setback most people face when dealing with water damage. However, water damage restoration is easily available. Restoration can take place in several ways including water extraction, sewage clean-ups, crawl space drying, structural drying, basement drying, dehumidification, odor control, sanitization, disinfecting, carpet cleaning, debris removal, emergency board-ups and mold remediation. 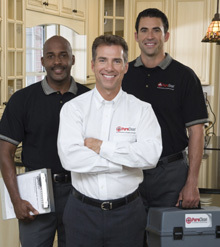 When dealing with water damage, calling in professional help is always preferable to attempting do-it-yourself methods. These do-it-yourself methods can be tedious, and the task on hand may not be completed thoroughly. Calling in experts will help you to document and account for the damage, which helps when trying to get compensation through a water damage insurance claim.